Motorola is back with another budget smartphone, Moto G4 Play. It is packed with 5-inch LCD screen with HD resolution with 294 ppi. The mobile boasts thin body and is available in both white and black. This smartphone gets an adept snapdragon 410 processor coupled with 2GB RAM and Adreno 306 GPU. Be it gaming or multitasking, all these finest inserts deliver smooth and zero lag performance. Moto G4 is equipped with decent camera duo, on the rear it gets an 8MP primary shooter with LED flash and autofocus feature and on the front, the 5MP selfie snapper captures clear and sharp images in both day and low light areas. As for the storage, the mobile gets 16GB internal space and is expandable up to 128GB via microSD card. Moto G4 connectivity specifications include 4G, Bluetooth, Wifi with hotspot, GPS and many other sensors. Moto G4 mobile is powered by 2800mAh non-removable battery that works for good 10hrs in single charge. Like all the predecessor models, moto g4 play too is priced in reasonable range and is a tough competitor for the new LG G4 smartphone. In a word, this new release is a basic smartphone with no jazzed up features. It is a good choice for everyone in budget. 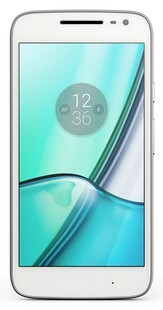 Motorola Moto G4 Play full specs and reviews as of Apr 2019. Buy it here!